Carl Viel, president and CEO of Québec International, is proud to announce a partnership between technology incubator-accelerator LE CAMP and Ubisoft. 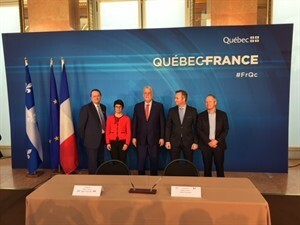 This partnership was confirmed today in the presence of Quebec premier Philippe Couillard, as part of the provincial government’s economic mission to France. This partnership, which is dedicated to the mentoring of technology startups, will also help to strengthen the France-Quebec relationship through exchanges of knowledge and expertise between LE CAMP and Ubisoft, a world leader in the video game industry. Thanks to this collaboration, digital startups from here may now qualify for Ubisoft’s mentorship program at Station F. Additionally, digital businesses from Ubisoft’s program at Station F will be able to benefit from a North American base to grow their entrepreneurial expertise and ensure their success in the Quebec and Canadian markets. Ubisoft is a partner of Station F, the largest startup campus in the world, which gathers a whole entrepreneurial ecosystem under one roof in Paris. Ubisoft’s program at Station F is designed for entertainment and video game companies. It is managed by the successful studio’s Strategic Innovation Lab. “This new partnership is an exceptional way to fuel the growth of technology startups from Quebec and France alike in the European and North American markets. Furthermore, this agreement is a testament to LE CAMP and Ubisoft’s ability to join forces for the good of startups in the entertainment industry, by giving them the boost they need to develop and successfully complete their projects,” concluded Carl Viel, president and CEO of Québec International. “Ubisoft is a world leader in the digital entertainment ecosystem. Our mentorship program for video game and entertainment startups is made possible by a network of internal and external experts. This network is key, as it allows us to answer questions from any entrepreneur. Our partnership with LE CAMP enhances this network and opens up new opportunities for Québécois and French startups,” confirms Catherine Seys, project manager at Ubisoft’s Strategic Innovation Lab and head of Ubisoft’s program at Station F.
A cornerstone of Québec City’s business community, LE CAMP is a vibrant home where ideas flourish and successful businesses are born. LE CAMP is an incubator-accelerator dedicated to growing tech businesses and guiding their creative projects. Located in the Saint-Roch neighbourhood in the heart of Québec City, it gives access to acceleration and incubation programs, as well as improvement and networking activities. LE CAMP is managed and led by Québec International, Québec’s metropolitan economic development agency. For more information, please visit lecampquebec.com. Ubisoft is a leading creator, publisher and distributor of interactive entertainment and services, with a rich portfolio of world-renowned brands, including Assassin’s Creed, Just Dance, Watch Dogs, Tom Clancy’s video game series, Rayman and Far Cry. The teams throughout Ubisoft’s worldwide network of studios and business offices are committed to delivering original and memorable gaming experiences across all popular platforms, including consoles, mobile phones, tablets and PCs. For the 2016–17 fiscal year, Ubisoft generated sales of 1,460 million euros. For more information, please visit www.ubisoft.com.